There are easy and interesting ways to reach Greece from Croatia, but there are also difficult ones. We are going to concentrate on reaching Greece from the northern parts. Otherwise check how to travel from Dubrovnik to Greece. 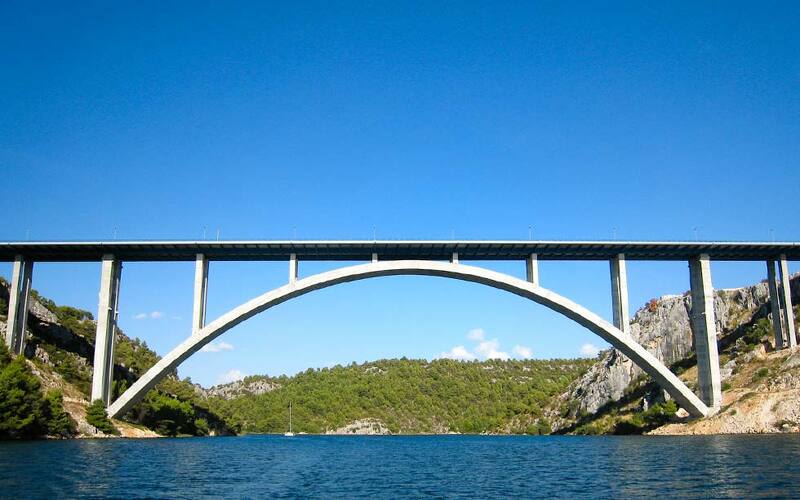 By taking the A3 (European E70) motorway from Zagreb you will easily reach Belgrade in 3 to 4 hours via Lipovac border crossing (cca 15,00€ motorway toll for the Croatian part). From Belgrade you will continue along the A1 (European E75) towards Nis and further south to Leskovac (cca 8,50€ highway toll). From Leskovac to the Macedonian border (Presevo crossing) take the local road 158 (motorway under construction on that leg, partially available). The motorway then continues again towards Kumanovo (MK) and continues all the way to the Greek border (pay attention not to end up in Skopje if not planned). The Macedonian motorway is in an excellent condition and the whole should cost about 7,00€. The E75 ends up West from Thessaloniki. In total the trip takes about 11 to 12 hours from Zagreb. It should be a nice scenic 500+ km drive trough 3 countries, but it gets increasingly difficult further down south as the lack of decent infrastructure. The easy part of the route usually follows the Montenegrin coastline to Bar and Tirana in Albania. In Tirana it gets fuzzy because you get to choose from three equally challenging and different routes: northern via Ohrid lake, southern following Adriatic coast or middle one via Gjirokaster. The easiest way to get from Croatia to Greece is by train. There is daily connection from Zagreb to Belgrade at 11:05 (arrival 17:35) and from Belgrade to Thessaloniki at 18:50 (arrival 10:07 on the following day). If you are in Split take the train to Zagreb first in order to connect to the above option. The ride from Bar to Belgrade is considered one of Europe's most scenic train rides! The tickets start at 24,00€ per person and the train leaves daily at 17:00 (arrival Belgrade 09:15). In order to reach Bar, take the bus from the Dubrovnik bus station (Panoramabus / Jadran Express) - it is not on their website timetable - leaving daily at 11:00 (arrival 15:15). Although you need to take two overnight trains in order to reach Greece, it is a great opportunity to spend the day in Belgrade. The train station is in the centre of the city so you can easily explore the attractions on foot. There are frequent connections from the Istrian Peninsula to Venice covered by VeneziaLines. The timetable is available on this link: Istria to Venice catamaran.There are several departure harbours so just look up the line that suits you the most. Further on, Superfast ferries cover a ferry line from Venice to Greece the whole year round. The trip takes about 30 hours but with all the available facilities on-board time will fly by (They have video games!!). The above timetables do not include the dates during which the vessels will not sail due to maintenance. / Departures and arrivals are indicated in local time. / Arrival times quoted indicate the time the ship arrives at the entrance of the port. Many people have asked us how to travel from Dubrovnik to Greece, most of them lost in various expensive tour offers, contacts of taxi drivers of the area and bus timetables of the surrounding countries. Numerous bridges, viaducts, flyovers, underpasses, passages, wildlife crossings, and over 50(!) tunnels make the Croatian motorways quite impressive and interesting to drive on.